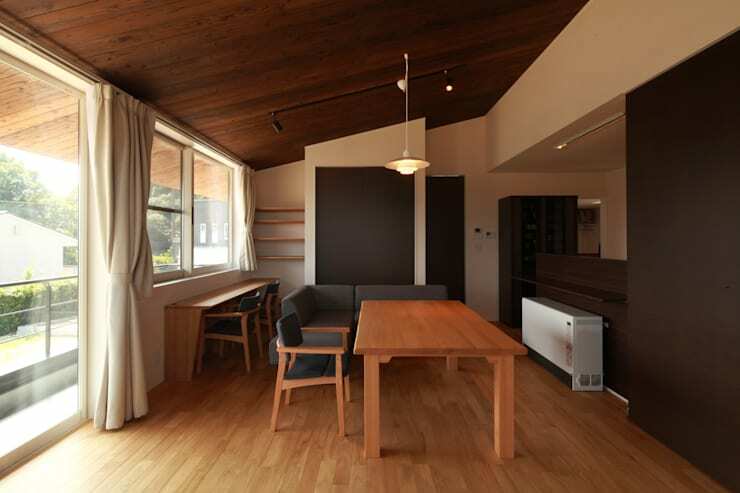 Today on homify we are taking a trip to Isahaya, a city located in Nagasaki Prefecture, Japan. It is region that was the site of the second atomic bombing during WWII. In this now quiet and relatively small city, the house we are looking at is a beautifully obscure and modern dwelling. 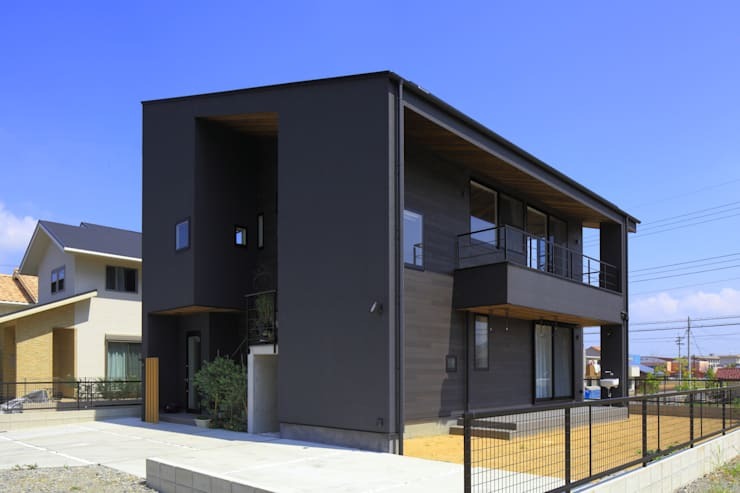 Comprised of many different architectural elements, the home displays all of the traits of a sleek and chic Japanese residence, with a certain level of minimalism adding to its dignified and refined aesthetic. The structure itself is an intimidating and bold design, however, inside the home is welcoming, warm, and inviting. Set on a site of 229.28m², the residence itself is 140.84m², and set over two storeys. Completed in February 2013, KTF House was beautifully produced by the team at Artect Design, and photographed by Y.Mizoguchi. To take a tour of this dwelling, check out the images below, and journey into a stylish, sophisticated, and unique abode. 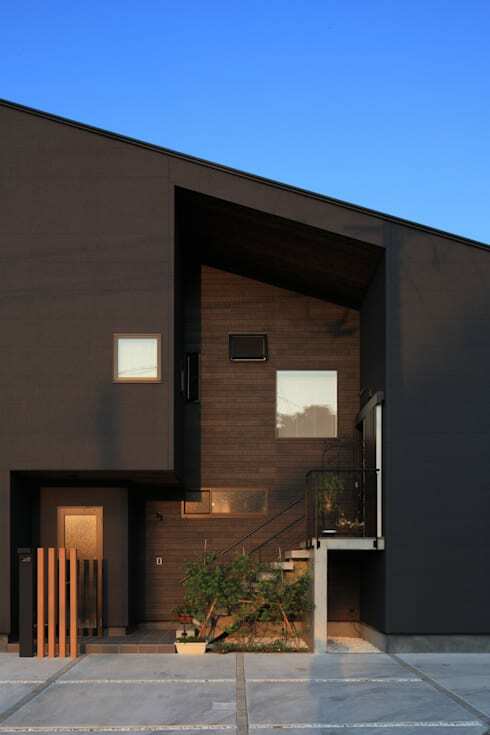 As our first image of this home, we are shown an imposing yet intriguing exterior. A little scary, moody, and extremely mysterious, this abode makes a bold impact upon its landscape. As we look through the power lines at at this new-build structure, one cannot help but be a little intrigued as to the interior design. The dwelling is a trapezoidal prism in its shape and form. It has shed roof, creating a smaller façade on one side, and a larger façade on the opposite side. 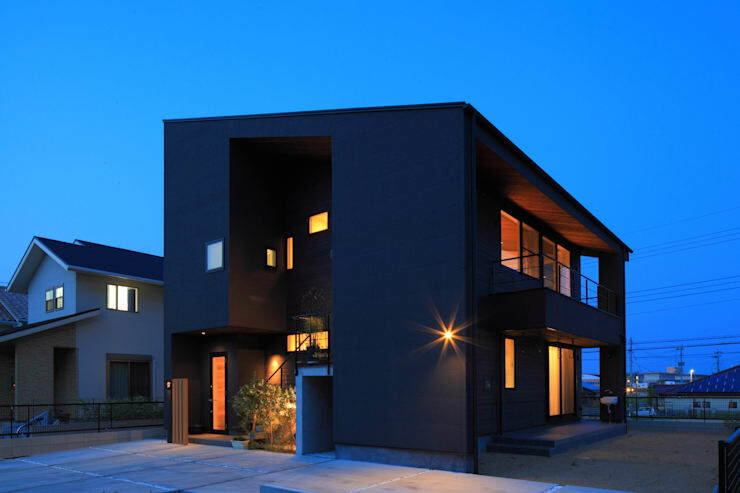 The hue used is an extremely dark timber, which from this angle, and at this time of day, appears black. Windows are employed extensively, and add to the overall enchantment of the house, creating a sense of wanting to see the style and ambience within. In this next image we move closer to the home and view the dwelling from an adjacent angle. Here it is clear this is a special house, with a captivating interior. Seen in the night, the exterior appears even darker than before. The home's inside lights are illuminated, adding a surprising warmth to the overall effect of the property. With no trees planted within the plot, the occupants have added some potted greenery at the entrance. The forms of the architectural elements are gorgeously abrupt and angular, creating a residence that demands attention, yet sits recessively and with quiet reservation. A large balcony is present on one side of the home, maximising views, and adding a stylish outdoor space for relaxation and contemplation. Downstairs the balcony is mirrored with a raised porch, and works wonderfully with the garden space. Again we move around to get a vision of the front of the home. The spectacular image in front of us suggests a range of angles that not only add to the interest of the property, but create a unique and visually enjoyable scene. Square windows dot the façade, imparting a sense of randomness. Furthermore, the entrance is situated to the right of the home, up a set of steps, and past the planted foliage. The façade is comprised of two different textures and materials. The first is a dark panel in a rich brown shade. This adds drama to the house, and ensures it is stylish, as well as a striking architectural feature. The second material used is a timber panel. This is seen in the cut-outs of the home, and are replete with a deep mahogany hue. Here we also get a better glimpse of the entrance. The front door is a highlight of the space, and is reached by a set of concrete stairs. There is also a service door to the left that provides entry into the home. Let's take a look inside! Inside, the home is amazingly warm and inviting. For a stunning yet monumental piece of architecture, the interior boasts a hospitable atmosphere with a sense of enthusiasm and sophistication. The design is minimal, and yet, appears to fit a range of domestic necessities into a very compact space. At the rear of the area is the living room and in the foreground we see the dining space. To the left of the room there is a small workspace, perfect for a family who may have children that require an area to do homework, but don't wish to be segregated to a separate space within the house. The ceiling flows from the inside to the exterior of the home, and this creates continuity between the outdoor living space, balcony, and the inside. Finally, we see multiple timber tones throughout, with a dark veneer within the kitchen area, reminiscent of the hue used on the façade of the home's exterior. Peeking from a different angle, we are able to see the magnificent views that this dwelling enjoys. The glazing is well insulated; protecting the home from the elements, but still allowing a huge volume of natural light to penetrate the interior spaces. The home's adornment is simple, with one hanging pendant light sitting low over the dining table, and several directed downlights near the television. Thick curtains are hung practically over each of the windows, offering privacy from neighbours, as well as allowing for an intimate and cosy space. Furniture is basic and comfortable, reminiscent of the Japanese minimalist aesthetic seen throughout this home's design and interior scheme. 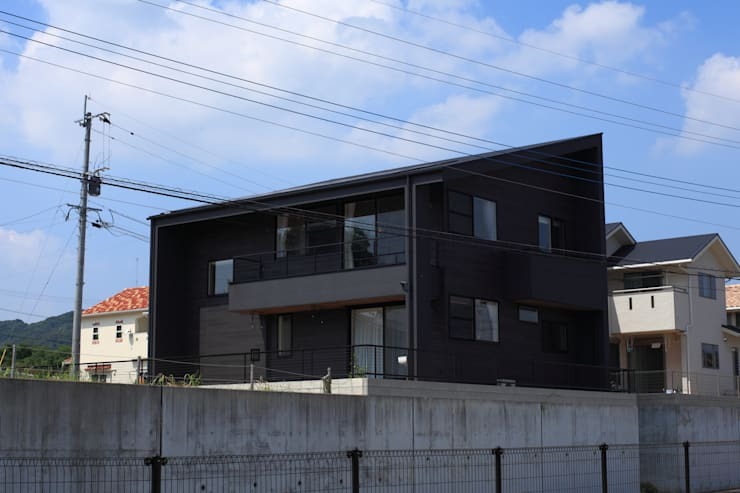 As we take one final look at the home during the bright daylight, we see the bold charcoal colour scheme, and rich timber panelling that has been used to cover the entire dwelling. The home is unlike any other house in the surrounding area. It is a stylish and inventive design, which employs cutting edge shapes, bespoke glazing, and imposing forms. However, the residence still manages to function as a comfortable and inviting home. 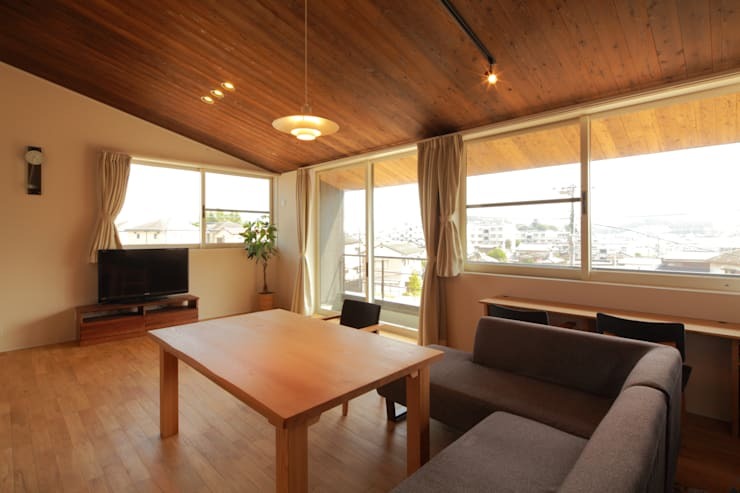 The interior is gorgeously warm and full of spirit, perfect for a large family, or a couple who enjoy a little space. Did you like this home? Let us know if it inspired you in the comments below!